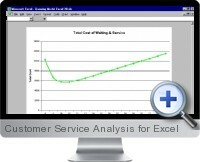 The Customer Service Analysis and Queuing Model for Excel will calculate the optimum number of customer service points (staff) to minimize costs for a business. It considers the average arrival rate of customers, the average customer service rate, the cost to the business of customer waiting time (customer dissatisfaction), and the cost to operate customer service points. Queuing models are used extensively in call centers, toll booth operations and situations where a there is a queue for service including, counter staff, service staff, call response staff or maintenance staff. They can be applied in any business providing a customer service function. Customer Service Analysis for Excel will calculate the optimum number of service points and allow the testing of alternatives by enabling manual input of service point numbers. Additional output results include the average number of customers waiting in the queue, their average waiting time, and service point (staff) utilization. The Total Cost Chart plots total cost versus number of service points to display the impact of changes in service point numbers.